Walking into Oak Flat was an experience we’ll never forget. Months of hard work, challenges, and joys all came together as we took our first steps into camp. Many people stood waiting for us, smiling and cheering as we entered with our dog Waldo, and the other brave people who had joined us for our final day of walking. Tears came to our eyes as the campground came into view and we took the last steps of our three-month walk. For those who met us as we came into Oak Flat, and for those who walked with us on that final week, we want to say thank you. The kindness and generosity that flows out of the San Carlos Apache community is overwhelming. And to those who couldn’t be there in person but have supported us along the way, whether financial or spiritually, we thank you as well. It took the support of many people, both friends and strangers, for us to complete this journey. The experience we had at Oak Flat was unforgettable. Never before have we met so many strangers who immediately felt like family. Never before have we seen so many passionate, dedicated activists united in one place. 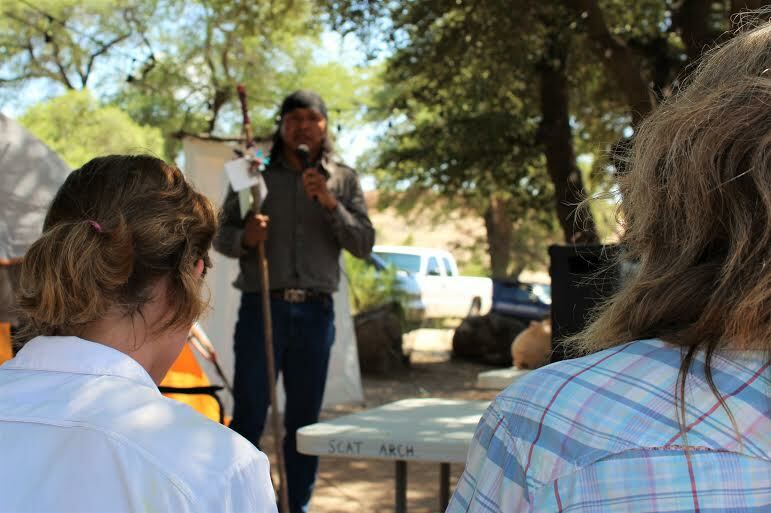 Apache Stronghold and their supporters are up against an incredibly wealthy mining company that has lawyers, lobbyists, and politicians. But we know this fight will be won because the power of Oak Flat is so strong it can be felt throughout the camp, the country, the world. Anyone who questions whether Oak Flat is sacred need only visit it themselves or speak with a member of Apache Stronghold to understand the truth. While we visited Oak Flat for a few precious days, we saw ancient petroglyphs, swam in a unique and breathtaking riparian swimming hole, spoke with tribal elders who shared memories of Oak Flat, and witnessed the harvest of acorns and berries used in traditional foods. 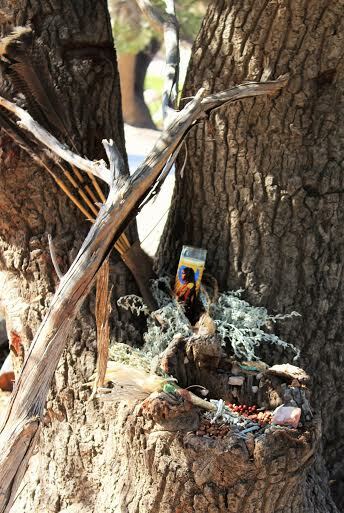 There is no question that Oak Flat is a holy site. There is no question that, by giving this land to a mining company, Congress is violating the right to religious freedom. And there is no question that we must do whatever it takes to protect this land. In the coming weeks we’ll be getting back to our jobs and everyday lives, but we will continue to keep Oak Flat in our hearts and fight to save it. We will keep our website and Facebook updated with ways you can help and information about the journey to Save Oak Flat. So stay tuned, stay alert, because we’ve only just begun. 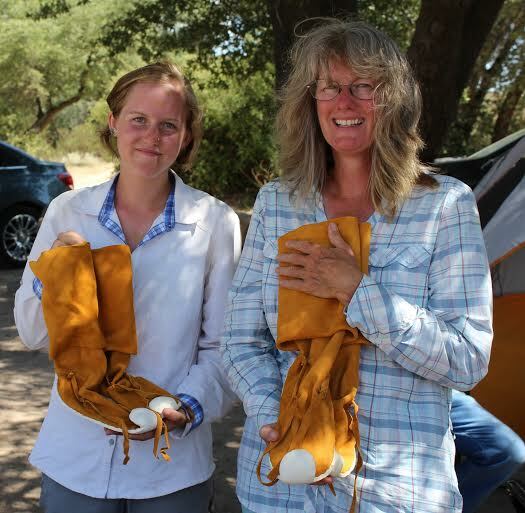 Emma and Sally, your selflessness is amazing and the sacrifices you made to support saving Oak Flats from senseless destruction are deeply appreciated by many even outside the Apache Nation. I am not Apache, or even Native American, but I did grow up in Superior and spent countless days throughout my life at Oak Flats. Giving it away should be considered a sanctionable offense, but with fighters like you two, the wish for its continued existence can be the reality. Thank you. I was so sorry to have missed you, by minutes apparently, when we came out to pick up our climate marcher friend, Kelsey Erickson, on the day you left. We’ll see you somewhere down the road though and I’ll look forward to it. Love and appreciation from another climate marcher!